Today’s cookies were inspired by a reader who sent me the recipe a few weeks ago. I happened to be at Disney World and couldn’t run to the kitchen to bake them, but on paper the recipe reminded me of “50 Good Cookies” which also calls for oats, cereal and coconut. But the recipe is different, as I found out today. 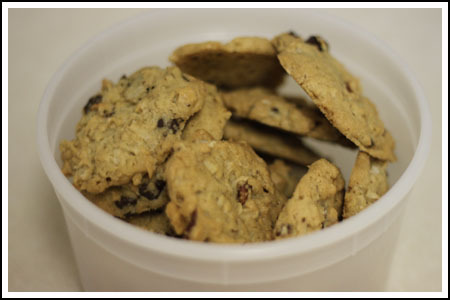 Alabama cookies call for less flour, more egg and a lot more oats. The resulting texture is crispy-edged and chewy with a lot of little air pockets. They also have a deep rich flavor from the toasted nuts and coconut (which I toasted as well). Here’s the recipe as I made it. I used half shortening and half butter, which worked well even though most of the original recipes just call for shortening. Also, the original recipe makes a bunch so I halved it and got out 3 dozen, which was enough for me and the construction guys. Now that there’s an island in my new kitchen, I’m dropping cookies on it and leaving. Oh, and how do you like this cookie tub? I bought a package of tortilla soup at Costco. They package it in bags then put each bag in a re-sealable tub. The soup doesn’t touch the tub since it’s in its own bag, so if you buy the Costco soup for $10, you get two free cookie tubs. Beat the shortening and butter together until creamy. Add both sugars and vanilla continue beating until light and fluffy. Add eggs and beat just until blended. Combine flour, salt, and baking soda. By hand or using lowest speed of mixer, add to the butter mixture. Stir in the oats, nuts, Rice Krispies, toasted coconut and dark chocolate chips. Drop dough by heaping teaspoons onto greased cookie sheets. Bake at 325 degrees for about 12-14 minutes or until edges are brown and cookies appear set. Let cool slightly on cookie sheets, remove to wire rack to cool completely. oh ok, i will try these. love the mix of ingredients. are you still at disney? is it humid there? did you go to denmark and try those rasp/cream cheese danishes? you must anna!! These sound alot like a cookie I make called “Texas Ranger Cookies”. I found them in a every kind of cookie type of cookbook years ago and have been making them since! Oooh! I love a crispy and still chewy cookie! Especially with chocolate. These cookies look like *just* what I needed! I recently made some bar cookies that had oats and coconut and chocolate chips which I had *really* high hopes for—and they came out rather lackluster and unsatisfying. Was planning to tweak the recipe, but now I think I will try these cookies first…the sound great! I love when something free comes with something else. Do the Krispies stay crispy? I thought I made a cookie once (LONG AGO) and they didn’t stay crisp, so I haven’t really tried them in a cookie since. I need a cookie! These look so good. I guess I shouldn’t be whining. I made strawberry shortcake last night. That’s nearly health food though!! Haha! These cookies sound delicious – I love all of the inclusions. And bonus about the soup/cookie tubs! I have to admit I dropped by to see if you’ve made another batch of the German Chocolate Chip cookies, but I always enjoy seeing what you’ve come up with. These look delicious with so many great add ins. I’ve never tried Rice Crispies in cookies before but if they hold on to their crunch, I definitely want to try them sometime.